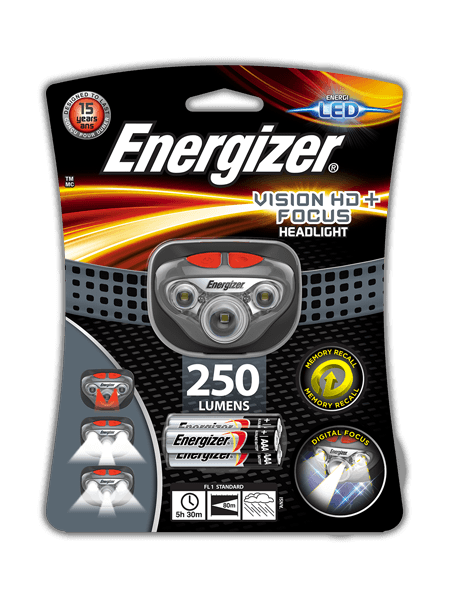 The Energizer® Vision HD+ Focus headlight is another innovative headlight solution within the Energizer premium headlight line. With the latest LED technology, users get an extraordinarily bright, lightweight hands-free solution with ample run time. Custom optics offer exceptional direct and peripheral vision, making the Energizer Vision HD+ Focus a perfect light for home, work and outdoor activities. Featuring patented digital focus, users can easily broaden or narrow their field of vision with a simple button press. Memory Recall allows users to quickly access to their favorite focus setting next time the light is activated. With an adjustable head strap, water-resistant design and pivoting head to direct light exactly as needed, Energizer continues to deliver innovative lighting solutions.